After handing my plastic crate over I was given a band to put around my wrist. There was a small wooden piece on it that showed the number of my container. Two words came to mind while placing the band around my wrist: Über efficient. Because I didn’t bring my own towel –next time I’ll bring one from the hotel– I rented one for $1. This is the biggest of the five pools. I’ll call the water temperature pleasantly warm and comfy. I took this photo after finishing at around 10 am. My goal was to arrive just after the opening time of 5 am. Because there was no pressure to adhere to this objective, I didn’t arrive until about 8:30 am. 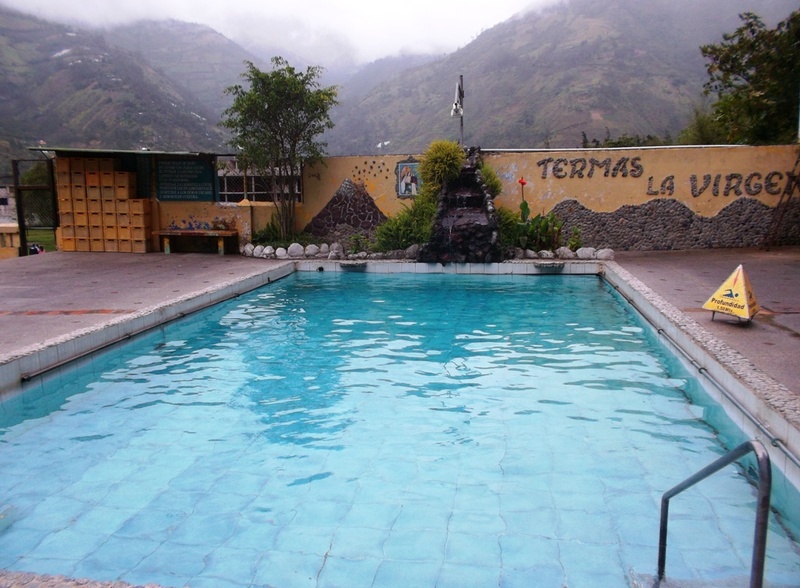 While sitting in this warm pool your’re able to gaze straight up at the cascada or waterfall. While doing this I thought: This isn’t just therapy for the bones and joints. It’s inspirational too. Experiences like this remind me that our earth offers amazing options. Beyond the above photo there’s a much smaller pool which is considerably warmer, to the point of being hot. I noticed a few people slowly making their way into this one while ohhing and ahhing. I enjoyed this particular pool for a few minutes before feeling the need to remove myself from it. Unlike the first pool shown, this onel is empty because it’s cold. I saw one person doing laps. After dipping my foot in, I deemed it too cold to get used to. If I go back to Terma de la Virgen I’ll bring my goggles and try swimming after warming up in the hot baths. These final two pools are located on the lower part of the complex, while the three others are up above where I took this photo. The picture that you see the woman swimming in is extremely hot. It felt fantastic as it acts as a natural opiate for the body. Sitting stagnant with my eyes closed brought on a super calm, while my body felt flawlessly relaxed. That didn’t last for long. My body and mind instinctively knew it was time to embrace the cool air. Upon stepping out I thought: This must be the hottest water I’ve ever put my body into. That’s when I began to feel featherbrained. TIP: Respect the heat of this pool. Go easy on your time spent in it. The tiny pool you see is ice-cold. I didn’t go in. In hindsight I realize that it’s not so shocking after your body is heated from the super hot pool water. Both of these lower pools are surrounded by rocks designed for reflexology. When my light headedness subsided, I gave them a try. Walking on the rocks sent an electric feeling up and throughout most of my body. I thought: I’d like to do this more often. I spent about an hour and a half at Termal de la Virgen. The experience was thoroughly theraupeutic until the very end when I felt a stinging and throbbing sensation on the side of my left, big toe. Perplexed, I didn’t know what to do. Thoughts were flashing: Do I tell someone here? Do I hit the local clinic? I should be wearing flip flops. At this hot spring there are hot and cold showers. I was close to a set of cold ones so I hopped in. This cold, heavily pressurized water helped my toe immensely while nicely cooling my entire heated body too. The ice-cold water refreshed me. I didn’t have soap like all the regulars did. They rigorously soap themselves under a hot water shower before and after getting into the pools. I decided to skip the little errands I had planned to go back to my hotel. While walking back I felt discomfort. I got back and immediately showered while scrubbing soap on and around the affected area. After drying I applied a ton of triple antibiotic ointment to my toe while leaving it to the open air. I repeated the shower, toe scrubbing and triple antibiotic ointment procedure two more times including at bedtime. Today –the next day– My toe is back to normal. 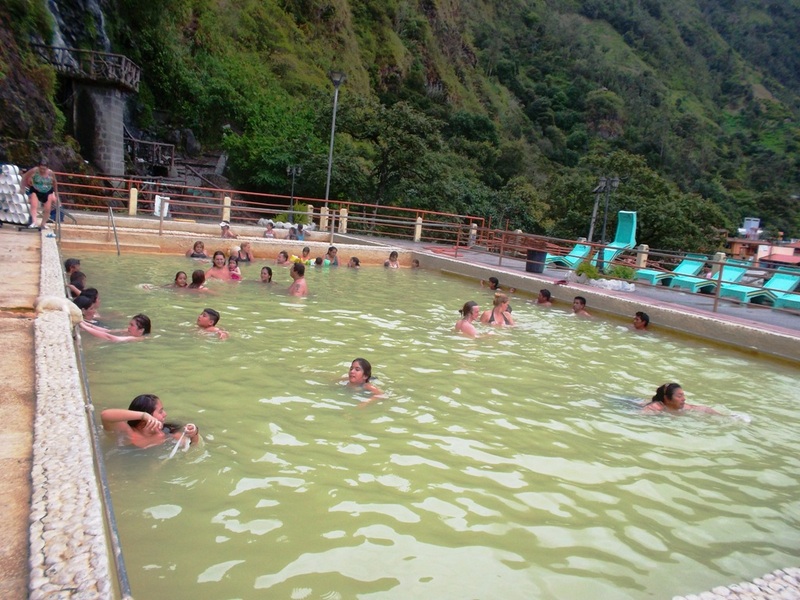 I read in the Rough Guide, Ecuador that it’s best to get to the hot springs early on as there are less people and less bacteria. On the bus down from Quito, I was talking to a Filipino Chem/Bio PhD candidate who thought there was nothing to worry about, as bacteria dies when it hits the water. I feel that this minor toe issue was a fluke. If I’d had flip flops on this probably wouldn’t have happened as it seemed to occur while I was walking outside of a pool, not when I was in one. Do you have any idea what happened to my toe? Have you heard of anything this strange ever occurring at a hot spring? Feel free to leave a comment below. Ooooh I was just in Banos a few weeks ago! 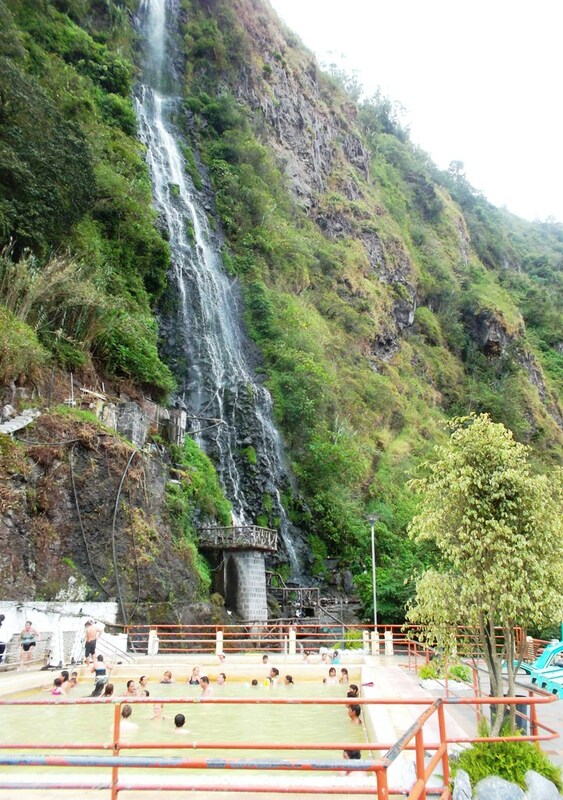 We also went to La Virgen…..3 nights in a row 🙂 The waterfall shower at the mid temp pool was my favourite aspect. And the hills around Banos, volcanic and mesmerising. Enjoy the rest of your trip! HANNAH: Thanks! Was definitely amazing to sit in a warm/hot pool and stare up at the hills and the waterfall. I went in the morning but now that you mention it the evening seems like a great idea as I found the thermal pools to be be sleep inducing. After taking care of the toe I took a two hour nap. DARREN: Take a look at the top first of four pix in this post: voila there’s your waterfall. I’ve tried others of the same cascade but I just can’t seem to get a shot that gives it the credit it deserves. I’ve got plans to study up on becoming a better photographer along with focusing on being more creative when engaging in photo exploration. What’s in the water that makes it murky? Is it just the color of the lining and the way it photographed? P: Volcanic ash and mineral sediments are what contributes to the murkiness. Due to the extreme heat in the bottom pool, this particular hot spring or termal is probably the most therapeutic I’ve visited anywhere. WARICA: Thanks! Yes I found the naturally heated pools to be quite therapeutic.